Police are harassed like this all the time, this just one example, sometimes it’s much worse and very dangerous. Three gunshots cracked the air close to where police were investigating a West Englewood shooting early Friday. There was no one dead in the alley. 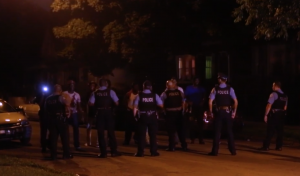 Police suspected the shots were a prank by a group of young men who had been heckling them for about an hour at the scene of a shooting that wounded a 22-year-old man in the 7100 block of South Paulina Street about 12:50 a.m. Standing in a line not far from the crime scene tape, they had been alternately threatening and teasing the officers. “You a traitor! You a traitor! You bogus as hell!” one of them said early on, focusing on the only black officer nearby.